OBJECTIVES: To determine the effect of potential anticancer property of secondary metabolites of Penicillium strain H9318. MATERIALS AND METHODS: Cytotoxicity of HT-29 cells was accessed using 3-(4,5-dimethylthiazol-2-yl)-2,5-diphenyltetrazolium bromide viability assay to give a preliminary comparison of the efficacy of fraction S1 and citrinin H9318. 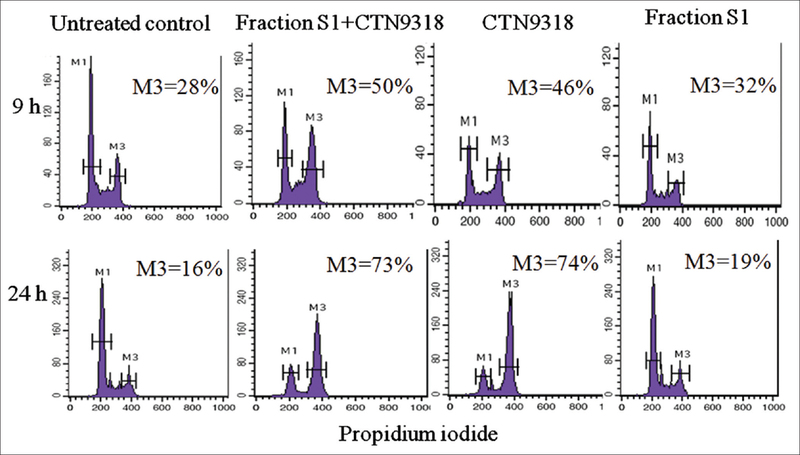 Mode of action of the combination treatment of fraction S1 and citrinin H9318 was determined by the cell cycle assay using propidium iodide-staining method performed with a flow cytometer. Further clarification of the anticancer mechanism of the combination treatment was carried out by the assays of pan-caspase, caspase-3/7, and western blot to examine the apoptosis of HT-29 cells. RESULTS: HT-29 cells show dose-dependent manner in cytotoxicity. HT-29 cells were arrested at G2/M phase with decrease in phosphorylated-retinoblastoma protein. Citrinin H9318, citrinin H9318 and fraction S1 combination-treated HT-29 cells show induction of pan-caspase. Caspase-3/7 was found decrease in the combination of citrinin H9318 and fraction S1 through up-regulation of phosphorylated-extracellular signal-regulated protein kinase 1 and 2 (p-ERK1/2). CONCLUSION: Citrinin H9318 alone did not reduce activity of caspase-3/7 significantly in the apoptosis of HT-29 cells. The combination treatment of fraction S1 and citrinin H9318 contributed to apoptosis via up-regulation of p-ERK1/2 with reduced activity of caspase-3/7. Protein phosphatase 1 (PP1) is one of the serine/threonine PPs that belong to the phospho-PP gene family and is abundantly expressed in animal cells. It is involved in many biological processes including cell cycle and apoptosis. The catalytic subunit of PP1 (PP1c) is responsible for most of the enzymatic dephosphorylation capabilities., Various natural inhibitors for PP1, okadaic acid and calyculin A, have been discovered to disrupt the cell cycle and to prompt oncogenic transformed and epithelial tumor lines progress into apoptosis. Further, PP1 has been found to be increased during rat liver regeneration and hepatocarcinogenesis. Fraction S1 and citrinin (CTN9318) were isolated from a soil filamentous Penicillium strain H9318 that was discovered in a reserved forest, Sabah, East Malaysia. Fraction S1 was found to have PP1 inhibitory property and exerted cytotoxic on cancer cell lines. The isolation and production of fraction S1 have been described in the previous report., The impact of PP1 inhibition in the cell cycle progression on premature mitotic outcome and cell death has also been described by the other reports. Citrinin is a mycotoxin found in food and feed as a contaminant, and it can cause nephrotoxicity and genotoxicity to animal and yeast cells., Genotoxicity of certain drugs was correlated with caspase 3-independent anticancer activity. Citrinin is also capable of inducing cell cycle arrest in normal mouse skin and apoptosis in a human promyelocytic leukemia cell line, HL60., Cancer is a multifactorial disease which is targeted by natural drugs from plants, marines, and microorganisms. There were numerous researches on the benefits of mycotoxins, such as patulin and aflastatin A as antitumor agents. The development of mycotoxins as new group of anticancer agents can be an alternative treatment to multidrug-resistant cancers. The effect of CTN9318, fraction S1, and their combination on cell cycle progression and apoptosis of colon cancer cell line, HT-29 was further investigated. A colon cancer cell line, HT-29, was obtained from American type culture collection (ATCC HTB-38) and was cultured in RPMI 1640 medium (Gibco) containing 10% fetal bovine serum and supplemented with 1% Penicillin/streptomycin (Gibco). Cells were propagated at 37°C, 5% CO2 and in a humidified environment. HT-29 cells at a concentration of 1 × 104 cells/ml were seeded into a 96-well plate and cultured in RPMI 1640 medium overnight. Cells were treated with two-fold serial dilutions of CTN9318 (50 μg/ml) and fraction S1 (400 μg/ml) for 72 h. 10 μl of a 3-(4,5-dimethylthiazol-2-yl)-2,5-diphenyltetrazolium bromide (MTT) solution (5 mg/ml) was added into each well using a multichannel pipette and incubated for another 4 h in a CO2 incubator. The liquid in each well was discarded, and the formazan crystals were solubilized with 100 μl of dimethyl sulfoxide. The microplate was mixed properly and absorbance was measured using an ELISA reader (Dynex Technologies MRX11) at 570 nm wavelength. The dose–response effect of CTN9318 and fraction S1 was expressed as a percentage of cell viability against two-fold serial dilutions of CTN9318 and fraction S1. The IC50 values were calculated chosen for further study on the effect of combination treatment with CTN9318 and fraction S1 on HT-29 cells. Cell cycle progression was shown using the propidium iodide (PI) stain intercalating with cellular DNA and then analyzed by a flow cytometer, FACSCalibur (Becton Dickinson). Briefly, HT-29 cells at a concentration of 1.5 × 105 cells/ml were seeded into a 24-well plate and incubated overnight. Cells were exposed to fraction S1 (200 μg/ml), CTN9318 (20 μg/ml), and the combination treatment, 200 μg/ml of fraction S1 and 20 μg/mL of CTN9318. Cells without treatment were used as controls. At 9 and 24 h of incubation, the cells were harvested and washed with phosphate-buffered saline (PBS)/0.3% of bovine serum albumin (BSA) and then centrifuged at 2000 rpm (Eppendorf Centrifuge 5415R, fixed angle rotor F-45-24-11) for 5 min. The pellets were fixed with ice-cold 70% of ethanol and kept overnight at −20°C. The fixed cells were washed and stained with PI after adding RNase solution. The percentage of PI-stained cells (10,000 gated single cells) was calculated using CELLQuest Pro software. Experiments were repeated at least 4 times. Activity of cellular caspases was measured using FITC-FMK-VAD in situ marker according to the manufacturer's instructions (Promega, USA). Briefly, HT-29 cells were seeded into a 24-well plate at a density of 1.5 × 105 cells/ml and were exposed to four treatments, CTN9318 (20 μg/ml), fraction S1 (200 μg/ml), the combination treatment consisting of CTN9318 (20 μg/ml), fraction S1 (200 μg/ml), and a positive control, staurosporine (STS) (1 μM). A nontreated control was also included. At 1 and 9 h, cells were harvested and washed with culture medium. Next, the cells were resuspended in a 500 μl of RPMI medium, and 1 μl of caspACE FITC-FMK-VAD in situ marker at a final concentration of 10 μM was added. FITC-FMK-VAD in situ marker is a FITC-conjugated analog of the pan-caspase inhibitor N-benzyloxycarbonyl-Val-Ala-Asp-fluoromethylketone (ZVAD-FMK), which is permeable to cells and binds irreversibly to the activated caspases. The bound marker was detected by FL-1 and quantified by CELLQuest Pro software of a FACSCalibur flow cytometer (Becton Dickinson). Ten thousand cells were analyzed and the percentage with activated caspases was calculated. Activity of caspase-3/7 was measured using the reagents from Caspase-Glo 3/7 assay (Promega, USA). Briefly, HT-29 cells were seeded at a density of 1 × 104 cells/ml into a 96-well plate for 24 h of incubation at 37°C before treatment. Cells were treated with CTN9318 (20 μg/ml), fraction S1 (200 μg/ml), and the combination treatment, CTN9318 (20 μg/ml) and fraction S1 (200 μg/ml). A positive control, 1 μM of STS, and a non-treated control were included. At the end of the incubation period of 1 and 9 h, 100 μl of a reagent from the Caspase-Glo 3/7 Kit, which was an equal volume to the samples, was added to each well and incubated for another 1 h at room temperature. The microplate was placed on a vortex mixer to allow cell lysis and the cleavage of the luminogenic substrates of caspase-3/7. Luminescence was measured by Glomax 96 Microplate Luminometer (Promega, USA), and luminescence intensity was proportional to the activity of luciferase indicating the activity of caspase-3/7. The experiment was done in duplicate and unit relative to luciferase activity relative light units was recorded. HT-29 cells were seeded in a 30 mm Petri dish More Details with a density of 3 × 105 cells/dish and incubated at 37°C for 24 h. Cells were incubated with CTN9318 (20 μg/ml), fraction S1 (200 μg/ml), and the combination of CTN9318 (20 μg/ml) and fraction S1 (200 μg/ml). A control (nontreated cells) was included. At 24 h, the cells were washed with ice-cold PBS and scratched with a rubber scraper in 100 μl of lysis buffer which contained 62.5 mM of Tris, 2% of sodium dodecyl sulfate (SDS), 10% of glycerol (pH 6.8), 1 μl of protease inhibitor cocktail (Sigma, USA), 1 μl of phosphatase inhibitor cocktail 1 (Sigma, USA), and 1 μl of phosphatase inhibitor cocktail 2 (Sigma, USA). Dithiothreitol (200 mM) was added freshly to the lysis buffer. Whole cell lysates were homogenized by a syringe fitted with a 28-gauge needle to shear the cellular DNA on ice. The lysates were centrifuged at maximum speed (13,000 rpm) for 15 s (Eppendorf Centrifuge 5415R, fixed angle rotor F-45-24-11). Lysates were fully homogenized to yield high concentration of proteins and boiled for 10 min to solubilize the native proteins. The concentration of proteins from the lysates was calculated using Bradford assay. Proteins in 10 μl were loaded into the SDS-polyacrylamide gel electrophoresis and were run at 30 min. The gel was then transferred to a polyvinylidene fluoride membrane using electrophoretic transfer method. After 1 h, the blot was blocked with 1% BSA for 30 min. The membranes were blotted with the following diluted primary antibodies in 5% BSA: 1:1000 phosphorylated-retinoblastoma (p-RB), 1:1000 phosphorylated-extracellular signal-regulated protein kinase 1 and 2 (p-ERK1/2), 1:1000 ERK1 (Neo Markers, USA), 1:1000 cleaved-caspase 3, and 1:1000 cleaved-caspase 7 (Cell Signaling Technology, USA). α-Tubulin with 1:10,000 (Neo Markers, USA) was included. The blots were washed 3 times with tris-buffered saline (TBS)/T (10 mM Tris, 154 mM NaCl, pH = 7.5 plus 0.1% Tween 20) at least 5 min each time with extensive agitation. Secondary antibodies at a concentration of 1:1000 in TBS/T were also added. Chemiluminescence detection was carried out using SuperSignal West Femto Maximum Sensitivity Substrate (Pierce, USA) and then visualized. Statistical analysis was performed using Microsoft Excel and student's t-test (SPSS window version 12.0) to evaluate the differences between treated and untreated groups at confidence level P = 0.05. Statistical significance was defined as P < 0.05 (*) and < 0.01 (**). Dose–response curves of HT-29 cells show viability against two-fold serial dilutions of fraction S1 and CTN9318 [Figure 1]. The shapes of the curves show cytotoxicity of cells in a dose-dependent manner. The IC50 for fraction S1 was ~150 μg/ml and IC50 was ~18 μg/ml. Morphological changes (data not shown) in CTN9318 and fraction S1-treated cells were in stark difference. In CTN9318-treated cells, the cells became rounded and were shining. However, fraction S1-treated HT-29 cells became darker and larger. Treatments with CTN9318 and the combination treatment (CTN9318 + fraction S1) arrested HT-29 cells at G2/M phase significantly. The percentage of cells arrested at the G2/M phase [Figure 2] increased 1.6-fold (CTN9318) to 1.8-fold (CTN9318 + Fraction S1) and 4.6-fold (both treatments), respectively, at 9 and 24 h of incubation period as compared to the untreated control. Cells arrested in G2/M phase increased from 1.5- to 1.6-fold after incubation with CTN9318 and CTN9318 + fraction S1 at time interval of 9 and 24 h, showing a time-dependent manner. Fraction S1 did not exert any significant change in the cell cycle progression. [Figure 3] shows a 2.5-fold increase in the activity of pan-caspase at 9 h by combination of CTN9318 and fraction S1 and CTN9318 alone. A 2.8-fold increase by STS (positive control) as compared to the untreated control at 9 h. The increase in incubation time resulted in the rise of pan-caspase activity for the combination treatment and CTN9318 treatment. 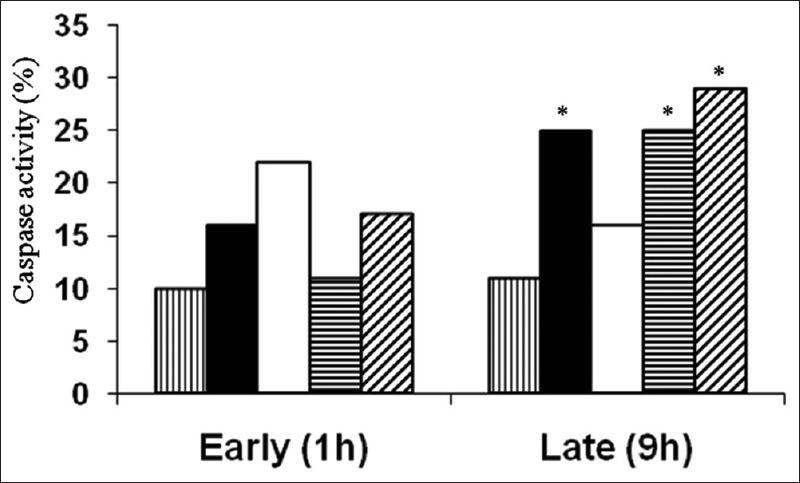 [Figure 4] shows a 3-fold decrease in caspase-3/7 activity in HT-29 cells treated with the combination treatment (CTN9318 + fraction S1) at 9 h as compared to 1 h incubation period. Positive control using STS to treat HT-29 cells demonstrated a 2.3-fold increase in caspase-3/7 activity at 9 h. No significant change in caspase-3/7 activity was observed with the treatment of fraction S1 alone and CTN9318 alone. To determine which regulatory proteins were involved in the mitotic block and apoptosis, whole cell lysates of HT-29 cells were harvested 24 h after treatments with fraction S1, CTN9318, and fraction S1 and CTN9318 combination. Expression of p-RB protein was decreased in the presence of fraction S1 and CTN9318 combination [Figure 5]a. The expression of other targeted proteins: Total RB, p-ERK1/2, total ERK, and PP1c were not altered by treatment with fraction S1 or CTN9318. 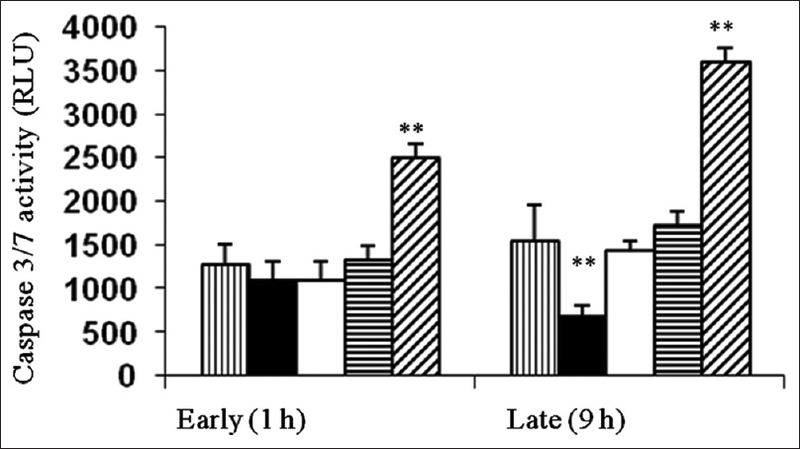 However, the expression of p-ERK1/2 was increased by the CTN9318 and fraction S1 combination at 24 h of incubation [Figure 5]b. No significant change in the expression of cleaved-caspase 3 and cleaved-caspase 7 was observed [Figure 5]c.
MTT viability assay showed that cytotoxicity was exerted by CTN9318 and fraction S1. Dose–response curve gives a direction on the choices of doses that could give impact on biological assays. The mode of action of CTN9318 + fraction S1-treated HT-29 cells in terms of cell cycle aberration and apoptosis was described in this paper. Commercially available citrinin caused G2/M phase arrest in human embryonic kidney (HEK293) cells, abnormal chromosomal segregation and DNA fragmentation in HT-29 cells., CTN9318, in our study, showed a similar catastrophe in G2/M phase. Interestingly, with addition of fraction S1 to CTN9318, not only did the HT-29 cells arrest at G2/M phase but with aberrations in regulatory protein in cell cycle progression (p-RB) as well as the regulatory protein in apoptosis (p-ERK1/2, caspase-3/7). In addition, fraction S1 has been found to harbor potential PP1-inhibitory property which could lead to a synergistic approach by combining with CTN9318 in the efficacy of antitumor. However, fraction S1 alone was unlikely to trigger the death of HT-29 cells in the G2/M-arrested state or apoptosis. Cell cycle progression to enter mitotic phase requires phosphorylation of cdc2 kinase on RB protein. By doing this, RB protein needs to be deactivated and thus the cell can proceed to mitosis. In a separate study, citrinin-treated HEK293 cells lead to the reduction of cdc2 kinase. This was correlated with our study as CTN9318 and CTN9318 and fraction S1 combination rendered a reduction of the expression of p-RB, postulating a possible explanation that the level of cdc2 kinase in HT-29 cells was reduced as RB is a substrate of cdc2 kinase. Pan-caspase activity was significantly increased by CTN9318 and fraction S1 combination and CTN9318 alone in HT-29 cells, suggesting that CTN9318 could execute a canonical apoptotic pathway (via caspases) in HT-29 cells. This result correlated with a previous report showing the ability of citrinin to reduce viability of HL-60 cells through canonical apoptosis. HL-60 cells were killed by the activation of multiple caspases including caspase-3 and 7 through mitochondrial pathway which was different from our result. Albeit the difference in caspase-3 and 7, cancer cells of HL-60 and HT-29 still succumb to pan-caspase-mediated apoptosis. With the addition of fraction S1 to CTN9318, caspase-3/7 was significantly reduced. 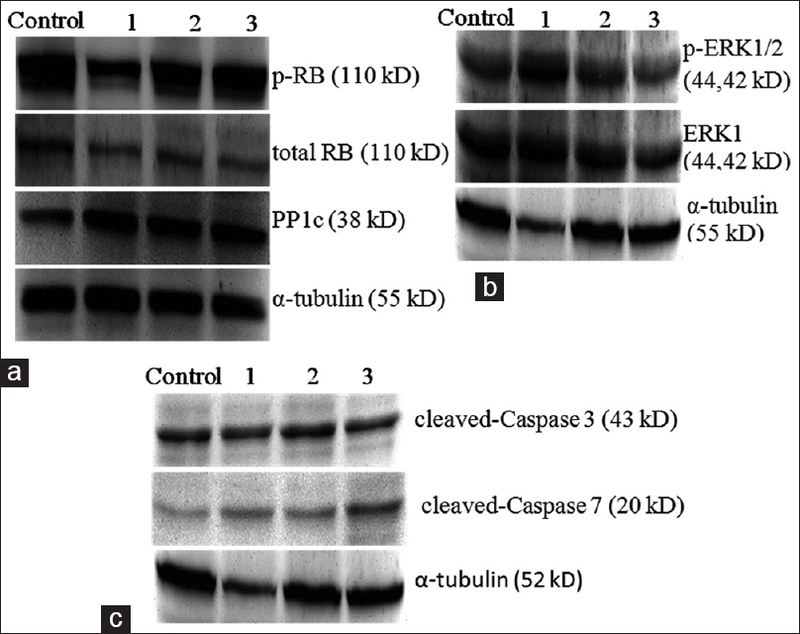 Caspase-3/7 is an executioner caspase in the canonical apoptotic pathway. It was interesting to show that the combination of CTN9318 and fraction S1 could lead to a caspase 3/7-independent apoptotic pathway in HT-29 cells. Alternative pathways of cell death independent of caspase-3/7 have been reported in a review paper. Fraction S1 alone did not induce change in the pan-caspase as well as caspase-3/7 activity. The cell death mechanism exerted by fraction S1 was different from CTN9318. Fraction S1 could possibly increase the sensitivity of HT-29 cells toward the apoptotic effect of CTN9318. Caspase-3 and 7 are always involved in the event of apoptosis; however, they are not necessary components of the apoptotic signal pathway. Pro-apoptotic protein could mediate caspase 3-independent cell death with a prerequisite role in the nuclear apoptotic change. In our study, nuclear change with a postulated premitotic event occurred with a reduced amount of p-RB might have an indirect connection with the caspase-3/7-independent apoptosis in HT-29 cells. Inhibition of caspase-3/7 was shown to prevent cell proliferation of cervical cancer cell line, HeLa, accompanying with a mitotic arrest at G2/M phase. Their report was correlated with the fraction S1 and CTN9318 combination treatment-induced G2/M arrest and a prominent reduced activity of caspase-3/7 in HT-29 cells. In addition, the combination treatment demonstrated a role of p-RB in the contribution of G2/M phase arrest in cancer cell line. In other words, inhibition of PP1 results in caspase 3/7-independent apoptosis coupled with a role of p-RB in the G2/M phase arrest. A translational targeted therapy for caspase(s) might shed light for the alternative antitumor therapy. ERK1/2 belongs to the signaling cascade of RAS/RAF/MEK/ERK which is initiated by ligands, oxidative stress, and growth factors. Generally, activated ERK1/2 will communicate with certain transcription factors to promote cell survival, but under certain circumstances, ERK1/2 can have pro-apoptotic functions. Fraction S1 and CTN9318 combination treatment promotes ERK1/2 activation with inhibition of PP1. Induction of cell death by the combination treatment is through p-ERK1/2 regulated signaling pathway. Activation of ERK1/2 and suppression of serine/threonine PP (PP2A) have been shown in cadmium-induced cell death of neuronal cell line and primary cells. In CTN9318-treated and fraction S1-treated cells, no up-regulation of p-ERK1/2 was observed. In the combination treatment of CTN9318 and fraction S1, PP1-inhibitory property of fraction S1 might contribute to the up-regulation of p-ERK1/2 as shown by the previous study, stating that inhibition of PP1 on human colon cancer, HCT-15 as well as on the rat neuroendocrine cells could induce cell death via activation of ERK/MAPK signaling pathway., Fraction S1 can enhance the efficacy of citrinin CTN9318 through pro-apoptotic up-regulation of p-ERK1/2 signaling pathway. Inhibition of PP1 can increase overall state of phosphorylation in HT-29 cells and thus to increase the activation of ERK1/2. Reversible phosphorylation is the basis for fundamental cellular activities. Secondary metabolites of Penicillium strain H9318 contain fraction S1 and citrinin CTN9318, which suppress cellular phosphorylation state to increase activation of ERK1/2 which in turn influencing the transcription factors of possibly Caspase-3/7, then, followed with the alteration of p-RB in the G2/M arrest phenomenon. This findings contribute to the knowledge of reversible phosphorylation-mediated crosstalk between mitotic block with caspase 3/7-independent apoptosis in anticancer approach. Cleaved-caspase 3 and cleaved-caspase 7 protein levels were not changed by the CTN9318 and fraction S1 combination in HT-29 cells when p-ERK1/2 was up-regulated. The protein level of PP1c was not affected by fraction S1 and the combination treatment, suggesting a possibility of structural modification to its conformation that changed its activity toward CTN9318 in the combination treatment. Fraction S1 did not inhibit directly toward PP1c due to the conformational changes of PP1c, instead a possibly intervention in mRNA of PP1c is postulated. CTN9318 arrested HT-29 cells at G2/M phase but not fraction S1. CTN9318 and fraction S1 combination arrested HT-29 cells at G2/M with reduction in the expression of p-RB protein. Results suggest that cell death by CTN9318 and fraction S1 combination was possibly through the induction of p-ERK1/2 protein and via caspase 3/7-independent apoptotic pathway. This work was supported by The Ministry of Science, Technology and Innovation under project 02-01-04-SF034 and The Ministry of Higher Education Fundamental Grant Scheme under grant 04-01-07-104FR. Ceulemans H, Bollen M. Functional diversity of protein phosphatase-1, a cellular economizer and reset button. Physiol Rev 2004;84:1-39. Cohen P. The origins of protein phosphorylation. Nat Cell Biol 2002;4:E127-30. Cohen PT. Protein phosphatase 1 – Targeted in many directions. J Cell Sci 2002;115:241-56.
von Zezschwitz C, Vorwerk H, Tergau F, Steinfelder HJ. Apoptosis induction by inhibitors of Ser/Thr phosphatases 1 and 2A is associated with transglutaminase activation in two different human epithelial tumour lines. FEBS Lett 1997;413:147-51. Ong SM, Voo LY, Lai NS, Stark MJ, Ho CC. Screening and characterization of microbial inhibitors against eukaryotic protein phosphatases (PP1 and PP2A). J Appl Microbiol 2007;102:680-92. Ooi SC, Ho CC, Seow HF. Isolation of a potential anticancer agent with protein phosphatase inhibitory activity from soil-derived Penicillium sp. strain H9318. Trop J Pharm Res 2016;15:1423-9. Sakoff JA, Ackland SP, Baldwin ML, Keane MA, McCluskey A. Anticancer activity and protein phosphatase 1 and 2A inhibition of a new generation of cantharidin analogues. Invest New Drugs 2002;20:1-11. Iwahashi H, Kitagawa E, Suzuki Y, Ueda Y, Ishizawa YH, Nobumasa H, et al. Evaluation of toxicity of the mycotoxin citrinin using yeast ORF DNA microarray and oligo DNA microarray. BMC Genomics 2007;8:95. Wu TS, Yang JJ, Yu FY, Liu BH. Evaluation of nephrotoxic effects of mycotoxins, citrinin and patulin, on Zebrafish (Danio rerio) embryos. Food Chem Toxicol 2012;50:4398-404. Jeon KH, Park C, Kadayat TM, Shrestha A, Lee ES, Kwon Y, et al. A novel indeno[1,2-b] pyridinone derivative, a DNA intercalative human topoisomerase IIα catalytic inhibitor, for caspase 3-independent anticancer activity. Chem Commun (Camb) 2017;53:6864-7. Kumar R, Dwivedi PD, Dhawan A, Das M, Ansari KM. Citrinin-generated reactive oxygen species cause cell cycle arrest leading to apoptosis via the intrinsic mitochondrial pathway in mouse skin. Toxicol Sci 2011;122:557-66. Yu FY, Liao YC, Chang CH, Liu BH. Citrinin induces apoptosis in HL-60 cells via activation of the mitochondrial pathway. Toxicol Lett 2006;161:143-51. Naskar S, Ghosh A. Mycotoxin-A target for anticancer drug development. Ann Med Chem Res 2015;1:1005. Cell Culture Basics, Invitrogen. Available from: https://www.vanderbilt.edu/viibre/CellCultureBasicsEU, pdf. [Last accessed on 2008 Jun 16]. Yedjou CG, Tchounwou PB.In vitro cytotoxic and genotoxic effects of arsenic trioxide on human leukemia (HL-60) cells using the MTT and alkaline single cell gel electrophoresis (Comet) assays. Mol Cell Biochem 2007;301:123-30. Cui HH, Valdez JG, Steinkamp JA, Crissman HA. Fluorescence lifetime-based discrimination and quantification of cellular DNA and RNA with phase-sensitive flow cytometry. Cytometry A 2003;52:46-55. The Protocol of CaspACE FITC-VAD-FMK in situ Marker, Promega. Available from: https://www.worldwide.promega.com/-/media/files/resources/protocols/. [Last accessed on 2008 Apr 10]. The Protocol of Caspase-Glo 3/7 Assay, Promega. Available from: https://www.promega.com/-/media/files/resources/protocols/technical-bulletins/. [Last accessed on 2008 May 18]. Muñoz-Gámez JA, Martín-Oliva D, Aguilar-Quesada R, Cañuelo A, Nuñez MI, Valenzuela MT, et al. PARP inhibition sensitizes p53-deficient breast cancer cells to doxorubicin-induced apoptosis. Biochem J 2005;386:119-25. Chang CH, Yu FY, Wu TS, Wang LT, Liu BH. Mycotoxin citrinin induced cell cycle G2/M arrest and numerical chromosomal aberration associated with disruption of microtubule formation in human cells. Toxicol Sci 2011;119:84-92. Ueno Y, Umemori K, Niimi E, Tanuma S, Nagata S, Sugamata M, et al. Induction of apoptosis by T-2 toxin and other natural toxins in HL-60 human promyelotic leukemia cells. Nat Toxins 1995;3:129-37. Jeswal P. Citrinin-induced chromosomal abnormalities in the bone marrow cells of Mus musculus. Cytobios 1996;86:29-33. Yuan J, Kroemer G. Alternative cell death mechanisms in development and beyond. Genes Dev 2010;24:2592-602. Kagawa S, Gu J, Honda T, McDonnell TJ, Swisher SG, Roth JA, et al. Deficiency of caspase-3 in MCF7 cells blocks Bax-mediated nuclear fragmentation but not cell death. Clin Cancer Res 2001;7:1474-80. Hashimoto T, Kikkawa U, Kamada S. Contribution of caspase(s) to the cell cycle regulation at mitotic phase. PLoS One 2011;6:e18449. Cristea S, Sage J. Is the canonical RAF/MEK/ERK signaling pathway a Therapeutic target in SCLC? J Thorac Oncol 2016;11:1233-41. Lu Z, Xu S. ERK1/2 MAP kinases in cell survival and apoptosis. IUBMB Life 2006;58:621-31. Xu C, Zhang H, Liu C, Zhu Y, Wang X, Gao W, et al. Rapamycin inhibits erk1/2-mediated neuronal apoptosis caused by cadmium. Oncotarget 2015;6:21452-67. O'Loghlen A, Pérez-Morgado MI, Salinas M, Martín ME. Reversible inhibition of the protein phosphatase 1 by hydrogen peroxide. Potential regulation of eIF2 alpha phosphorylation in differentiated PC12 cells. Arch Biochem Biophys 2003;417:194-202. Lee JH, Lee JS, Kim SE, Moon BS, Kim YC, Lee SK, et al. Tautomycetin inhibits growth of colorectal cancer cells through p21cip/WAF1 induction via the extracellular signal-regulated kinase pathway. Mol Cancer Ther 2006;5:3222-31.